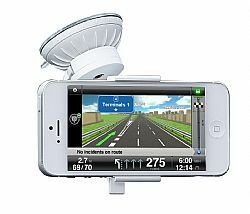 Just Mobile Xtand Go is an award-winning, versatile car mount for your iPhone. Xtand Go secures your iPhone 5 and 4S/4 on your windshield by a suction cup or to the dashboard by a Go button while you drive. A patented, German engineered folding arm extends and adjusts your iPhone to any viewing angle, while keeping the dock connector free for charging. The Go button allow you to mount iPhone in a protective case, or iPod touch, and other devices. Now with iPhone 5 bracket.